Morocco is ruled by King Mohammed VI. He is fairly popular within the country and seen as more liberal than his father, was as king. Morocco is considered a stable nation, but there is international concern over individuals from Morocco who were involved in internal and external terrorist attacks. There is a concern by some that if economic conditions do not improve, more Moroccans might turn to extremism. So far this has not occurred and most Moroccans practice a peaceful form of Islam. Morocco and the United States have a long history of close relations. The U.S. military trains with the Moroccan military on a regular basis. The Moroccan military is very capable, especially by African standards, and is seen as a leader to other countries in the region. One of Morocco’s most striking features is its geographic diversity. The varying topography found in Morocco has played a large part in shaping its history. Morocco has a 1,835 kilometer (1,140 mile) coastline, which has brought the country many tourists and economic opportunities but also many problems. Throughout its history Morocco has had to defend its coasts from foreign invaders and pirates. Current concerns in the coastal areas are smuggling, illegal fishing, and illegal immigration. The largest mountain peaks in Northern Africa are located in central Morocco. There are several different mountain ranges in Morocco: the Rif, the High Atlas, the Middle Atlas, and the Low Atlas. The harsh winters and the poor roads leading into the mountains leave these regions isolated from the rest of the country for much of the year. The mountain ranges also served as a natural barrier against invaders from the east. Far eastern Morocco and southern Morocco are desert regions. The Sahara is a harsh environment and sparsely populated. Most populations in this region are nomadic. Although the land is unable to support any agriculture, there are phosphate deposits in the Western Sahara that are an important source of income for Morocco. Due to its strategic location, Morocco has always been susceptible to foreign invasion. It has a long, complicated history involving ever-changing dynasties and rulers. The Carthaginians, Romans, Phoenicians, Vandals, and Byzantine Greeks were among the many foreign powers that entered Morocco in ancient times. Although all these groups left an imprint on the local Berber population, it is the Arab arrival that had the most influence on present day Morocco. In the 7th century, the Arabs entered what is now Morocco and clashed with the Berbers. The goal of the Arabs was to spread Islam, and they did so through force. The Arabs who came to Morocco were mostly single men. When they settled in the area they married local Berbers and the two ethnicities became intertwined. The communal style of the Berbers clashed with the authoritarian style of the Arabs and conflicts continued. For the most part, the Arabs who settled left the Berbers alone and lived as the urban elite. The next major wave of Arabs arrived in the 11th century. This influx of Arabs was hard on the Berbers because many were pushed off their farming land. Those who stayed in the plains lost most of their traditional Berber customs. Many of the Berbers moved into the mountainous areas, where most still live today. Throughout the next several centuries, Morocco was never a truly unified country. Different sultans of varying influence controlled limited areas. The rural Berbers often refused to recognize the sultan and power frequently shifted between different tribes. Treaty of Fez, officially making Morocco a French protectorate. Spain was given control of the most northern and southern regions of Morocco. The Sultan remained the religious leader of Morocco, but the French controlled most other aspects of Moroccan life. Regardless of the many faults of the protectorate system, Morocco was fortunate compared to most African colonies. The French resident general to Morocco, Marshal Lyautey, was concerned about Moroccan culture. His order to not offend a single tradition or change a single habit allowed Morocco to preserve its culture and its unique identity. Within two decades of French rule, more than 350,000 Europeans lived in Morocco. 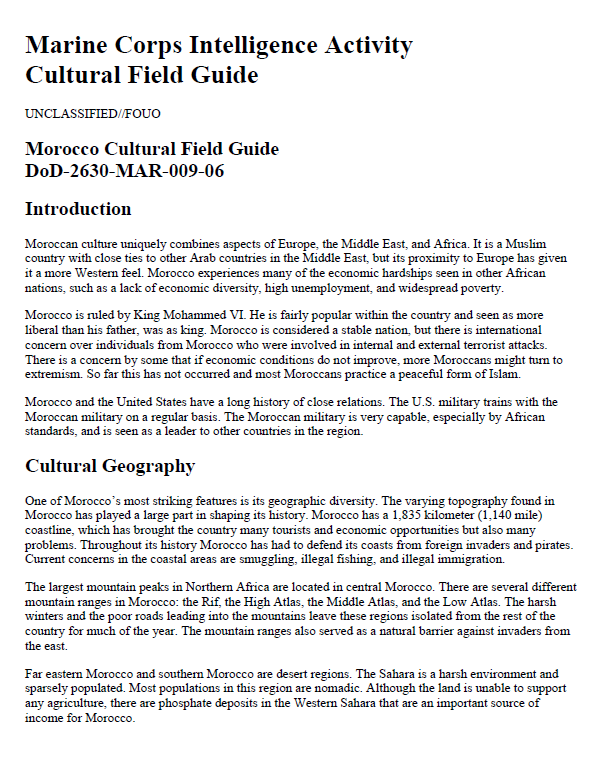 Moroccans lost about a million hectares (3,861 square miles) of agricultural land and control of mineral deposits and other natural resources to the colonizers. These issues caused resentment and economic hardships that exist today. Rebellions against the French occurred throughout the country but the French military was able to control them. The nationalist movement against French occupation reached its peak when France exiled the popular sultan, Mohammed V. After 3 years of violent protests and attacks, France permitted Mohammed V to return to Morocco and granted Morocco its independence in 1956. After Morocco received its independence, King Hassan II ruled for almost 40 years (1961-1999). His reign was marred by oppression and accusations of human rights violations. His authoritarian style became more oppressive after two coups were attempted by members of his military. His son, Muhammed VI came into power in 1999 and has gained popular support. Although he still demands absolute power, he has done his best to ensure that Moroccans have the rights they are entitled to under the constitution.